Dissolve instant yeast in 1/3 water. Set aside. In a mixing bowl with dough hook or flat beater attachment, place the sifted all-purpose flour, sugar, and salt. Mix at low speed until incorporated. Add the dissolve yeast remaining water, eggs, and evaporated milk. Mix at low speed for approximately 4 minutes. Add the unsalted butter and continue mixing until gluten is slightly developed. Transfer the dough to a greased bowl and cover with plastic. Punch down the dough and divide it into pieces weighing 60 grams each. Round each piece. Let the dough rest for 15 minutes. Cover with plastic to prevent from drying. Roll out the pieces thinly into 8″ times 5″ rectangles. Brush surfaces with butter. Roll each piece into a long rod and twirl into shape, locking ends to seal. Place each piece in a greased ensaymada molder. Let the dough rise until it doubles in size (approximately 1 hour and 30 minutes at room temperature). Bake for 17 minutes or until golden brown in color. Let the bread cool, then remove the molders. 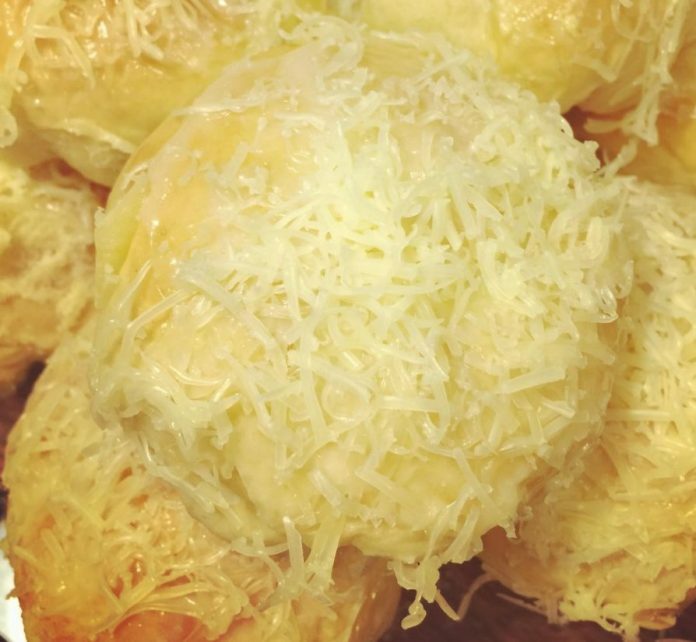 Brush the top of each ensaymada with creamed butter and sprinkle with grated cheese and sugar.